Dead men tell no tales, it seems, but they look downright terrifying on a film poster. Yes, the latest one-sheet for Pirates of the Caribbean: Dead Men Tell No Tales has sailed in, and it heralds a brand new look at Javier Bardem as the glowering Captain Salazar. Dubbed the most formidable and malicious foe that Johnny Depp’s Jack Sparrow has ever faced, Salazar is truly a force to be reckoned with, and his mere presence is enough to place every pirate and seaman on red alert – Jack included. How does one combat such a powerful adversary? By hunting down a lost artifact known as the Trident of Poseidon, and we know from the first teasers that Sparrow will be forced to strike an uneasy alliance with Carina Smyth (Kaya Scodelario), a brilliant astronomer, and Henry (Benton Thwaites). Speaking of which, it’s understood the full-length trailer for Dead Men Tell No Tales will be with us imminently, at which point we’ll surely get another look at those ghastly ghost sharks. Franchise newcomers Joachim Rønning and Espen Sandberg are behind the lens. Marking Captain Jack’s first foray onto the high seas in almost six years, Pirates of the Caribbean: Dead Men Tell No Tales is expected to dock in theaters on May 26th. It’s one of the biggest tentpoles on 2017’s summer slate, and one glance at the calendar will tell you that Disney’s blockbuster sequel will be sharing a release window with Alien: Covenant, Baywatch and Wonder Woman, with Patty Jenkins’ origin story poised to open the following week. 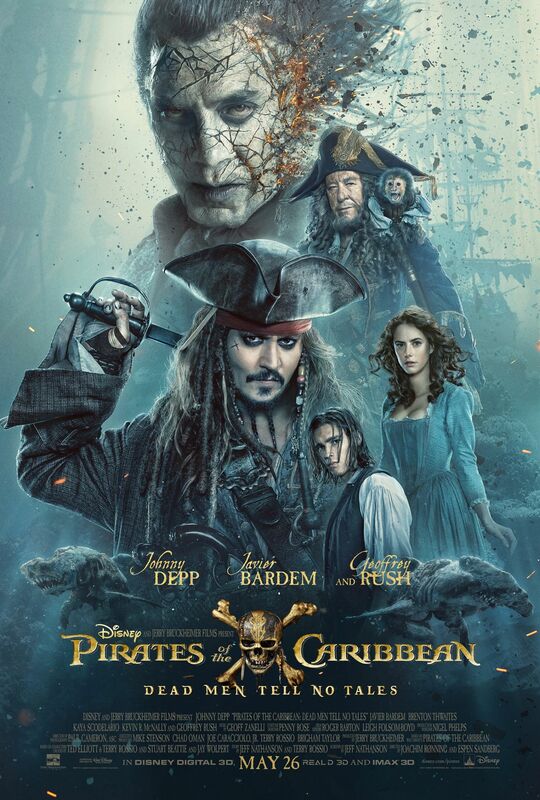 Johnny Depp returns to the big screen as the iconic, swashbuckling anti-hero Jack Sparrow in the all-new ‘Pirates of the Caribbean: Dead Men Tell No Tales.’ The rip-roaring adventure finds down-on-his-luck Captain Jack feeling the winds of ill-fortune blowing strongly his way when deadly ghost sailors, led by the terrifying Captain Salazer (Javier Bardem), escape from the Devil’s Triangle bent on killing every pirate at sea – notably Jack. Jack’s only hope of survival lies in the legendary Trident of Poseidon, but to find it he must forge an uneasy alliance with Carina Smyth (Kaya Scodelario), a brilliant and beautiful astronomer, and Henry (Benton Thwaites), a headstrong young sailor in the Royal Navy. At the helm of the Dying Gull, his pitifull small and shabby ship, Captain Jack seeks not only to reverse his recent spate of ill fortune, but to save his very life from the most formidable and malicious foe he has never faced.